I had high hopes for Commissary, the new bar/coffeehouse/restaurant hybrid near Logan Circle. Positioned at the perfect midway point between my house and the Y, I had visions of stopping in beforehand for a cappuccino, or afterwards to unwind with a tall pint of pureed berries. 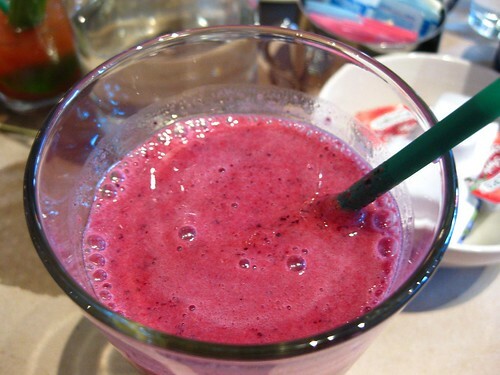 And indeed, the smoothies at Commissary are delicious, especially the Very Berry – a purple garden in a glass. But as far as being able to call it my new third place, well, not so much. Part of the EatWell empire responsible for Logan Tavern, Grillfish, and The Heights, Commissary replaces Merkado Kitchen – but apart from a paint job and the addition of a floating lounge in the center, retains the open design and high industrial ceilings of the former. The concept appears to be aiming along the lines of the popular Busboys and Poets. But there’s something lacking here. I can’t quite figure out why it leaves me cold, but after three visits, I’m not anxious to return. I just can’t imagine stopping by to hang out at the long bar for a pre-workout smoothie. Neither can I feel comfortable in one of the armchairs in the center lounge, nursing a cappuccino while working on a laptop. Though the rug underpinning the lounge area helps diffuse the noise element in the sparse space, the area just doesn’t say cosy to me. Maybe I’m too paranoid to write where I know nearby diners can easily see what I’m working on… but it just seems too manufactured. “You Should Sit Here And Write!” its little lapdesks almost seem to scream. Um, maybe for spreadsheets, but creativity doesn’t work that way. As far as the food, the problem of trying to be all things to all people is again highlighted here. Like all the EatWell spots, the food is decently dependable, but nothing brilliant. A friend described the ambiance as “the urban equivalent of Olive Garden,” and I think this encapsulates neatly why it makes me uneasy. The entire block of new development on P between 15th and 14th is calculated to make people who once refused to walk down that expanse feel at home. Despite a few notable exceptions like New Vegas Lounge, it’s fast losing any grit. I think your friend hit it on the nose, though I tend to describe the EatWell branches as a step up from Bennigan’s. They’re (successfully) designed to meet the suburban/exurban ideal of casual dining. They seem to lack any emotion or passion whatsoever, and replace it with demographically targeted, corporate taste. And of course in DC where everyone is from somewhere else, the bland middle ground can be extremely successful. That said, they’ll also serve breakfast until 5PM, so… I’ll probably go at least once anyway. Giving me breakfast food whenever I want is pretty much the way straight to my heart (Just ask Tom!). While I agree that this EatWellDC location has had continual identity confusion, I find the comparison to Busboys way off. My office is only one block from Busboys and I frequent it often for business lunches and happy hours. There’s plenty of suits and stilettos hanging out there and lately I’ve seen quite a few baby strollers. Plus with Andy Shallal opening his third location, the whole concept feels less unique now that it is a local chain. I tried Commissary for brunch and they had attentive service without making us feel rushed. We took as long as we wanted and enjoyed our meal. And you can’t beat the prices! For me, the great value is what makes this a great neighborhood hangout. Perhaps the owners could take a look at the layout so all the legions of laptop users don’t feel like they’re on a stage. Thanks for the comment, Mike. All I meant is that Commissary is aspiring to the same type of concept as Busboys – a bar/coffeehouse/restaurant hybrid. That’s it – I’m not drawing any further comparison between the two. Perhaps I should write about Busboys in the future, as it also brings up some interesting points on development, gentrification, et al. However, as to the service at Commissary for food, I’ve had one nicely served brunch there and one appallingly served lunch. So 50/50 on food service. I always question urbanites who embrace “grit” and decry gentrification. Why? I for one am an urbanite simply because life is easier living close to work and having stores, restaurants, and attractions at my doorstep. I like clean restaurants and safe neighborhoods. Call me a yuppie if you will. I can occupy myself and live a full life without having to pose as an urban hipster. People live in cities for many different reasons. Certainly, convenience is a big factor. But atmosphere is also high on the list for many. So, Hipster vs Yuppie? Not necessarily. I think it’s more complex than that. Why would it be “posing” to accept the fact that not everything is clean and safe, that life can’t always be easy? And, do these labels really matter anymore? Isn’t everyone a hybrid in these days of egocasting anyway? These are all really interesting comments and I hope to revisit the issues that are coming out in a larger article soon. I’ll have to mull it over. You wouldn’t recognize either of these stretches of road from a decade ago, but the evolution of the 14th street region around Studio theater is nothing like the changes on 7th. Certainly there’s a lot of people who like the way the region around Chinatown has changed, otherwise it wouldn’t continue to be successful. I’m troubled, though, by the fact that places like Clydes, Fuddruckers, Gordon Biersch, Potbelly, etc seem to have -completely- displaced the independent eateries. A happy middle ground would be awesome, but it never seems to exist. There’s some critical mass of chain restaurant that – once it gets there – somehow pushes out everything else. So if my choices are only those two extremes I’ll take the urban hipster label (as laughable as it is to anyone who knows me) since I can find chain stores anywhere. I’d rather have it all, though. How do we manage it? I suspect that the reason the middle ground never seems to exist is that the chains are able to bid higher for space, which pushes up rents until the local businesses (who don’t have other locations that can make the money until the new location is profitable) can’t afford to move in. That’s just my uneducated guess, though. Yes, things change-but as a middle aged black Washingtonian, the cocktail of radical age and race change is enough to keep my therapist working for a long time..